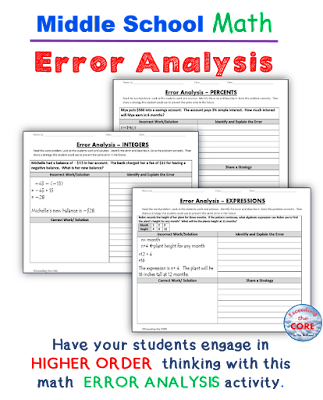 I am a math teacher and I have been creating and using math error analysis activities with my students (Grades 5 - 8) for the past 13 years. Giving students opportunities to identify and correct errors in presented solutions allows them to show their understanding of the mathematical concepts I have just taught. Every time I incorporate math error analysis activities into my lessons I am always amazed at how quickly it leads to richer discussions and deeper thinking among my students. They suddenly become little math critics and their focus broadens from getting the answer to understanding the process. 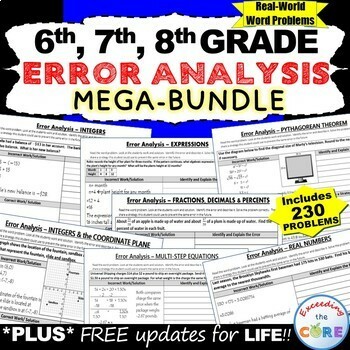 Each of my 'Math Error Analysis Activities' includes 10 real-world WORD PROBLEMS that are solved incorrectly. Students have to IDENTIFY THE ERROR, provide the CORRECT SOLUTION and share a helpful STRATEGY for solving the problem. An ANSWER KEY has also been provided with examples of possible answers. When I present this activity to my students, I tell them that these are errors that students from my other class made and I need their help to correct them. Students LOVE correcting other students mistakes. 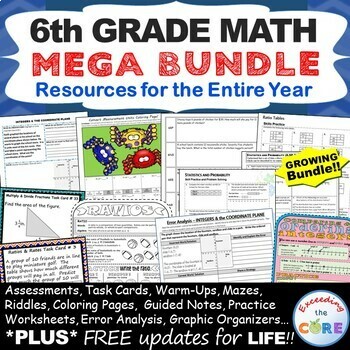 I have my students use these activities with a partner, as a warm-up , as classwork, homework, in math centers and for group work. 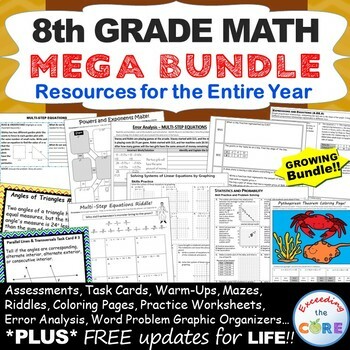 I currently have math error analysis activities for more than 30 math topics for grades 5 - 8. ♥ Love this! If kids can find and explain the error(s), I know they understand the concept!! ♥ I love error analysis activities. These were great-I liked how they asked for a strategy. 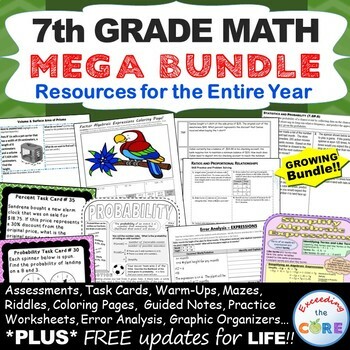 ♥ Great for higher order thinking! ♥ This is such a great way for students to see common errors and ensure they don't make the same mistakes. Generates a lot of discussion. Thank you. ♥ Love the format! Going to use this as a test review. Thank you for sharing your hard work!